I’ve prepared myself to do without my “lawyer.” She, like the rest of the attorneys attached to the system, can’t do anything that isn’t convenient for the Prosecutor, who is the representative of the State. Justice in my country doesn’t have its hands tied, for a long time they’ve been cut off. The scales of justice is welded to one of its sides. My lawyer tells me to remember all the legal and judicial proceedings that have violated my person. My representative has no option to go to a legal entity to demand justice. Her word is: hope. Mine is: evolution. In Cuba right now there is a group of Lawyers who through the State’s own laws are asking to be recognized as independents. The Minister of Justice ignores their request. The Minister violates and infringed on his own laws which he should be upholding. Given that my “lawyer” can’t do anything about it, I am just waiting for the machinery of the system to alert her when to open her mouth, and I will hire these independent lawyers who are closer to my social position. Before making this decision, I had a first interview with the attorney Wilfredo Vallin. After listening patiently to my legal situation, he agreed to represent me. He just asked me to write down the facts and give them to him. A friend of mine, on learning of my decision, told me it’s just one more step to tightening the noose around my neck. Perhaps he’s right. He’s almost certainly right. But in any event I can’t stand living with the rope around my neck any longer. We all know that we live with the noose, but as long as it doesn’t tighten it doesn’t matter, surviving is what matters. Some are used to it and may even forget about it. Others live in perpetual vigilance to avoid its being tightened, and with their daily acts maintain that status. None of these alternatives is life. I prefer they pull it tight while there is still oxygen in my lungs. 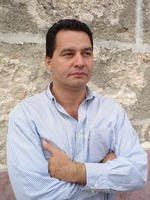 This entry was posted in Ángel Santiesteban. Bookmark the permalink.